The GoFar program focuses on a core area of deficit identified in FASD; that is, on disorders of affective and cognitive control that are central to behavioral and adaptive disorders from infancy through young adulthood. By school age, such problems often present as attentional problems, deficits in executive functioning and disorders in conduct and behavior. GoFAR develops methods to address these problems in young children by bringing together computer game technology and behavioral techniques for affective and cognitive control. The methodology is based on previous work that suggests that a metacognitive technique (FAR: “F” Focus/Plan, “A” Act, “R” Reflect) is helpful in improving behavioral and educational outcomes in FASD. 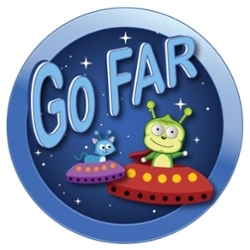 An important element is the GoFAR computer game, a “serious game” that supports the understanding and development of metacognitive control techniques and reinforces its use by clinically-referred children, ages 5 to 10 years. This game is incorporated into a 10 week, manualized intervention program which focuses on improving adaptive functioning and behavior. We carried out a clinic trial of a pilot group of 30 alcohol-affected children and their caregivers. Outcome measures included both standardized assessments suitable for a clinical setting and measurement of changes in physiological response. Pre and post testing allowed a preliminary understanding of the usefulness of the program elements, including the GoFAR game, as well as the suitability of the outcome measures selected. More comprehensive evaluation of the efficacy of this methodology in treating the neurodevelopmental disorders associated with FASD is planned. GoFAR includes a computer game that teaches children to control impulsive and problematic behavior. Parents and Caregivers are an important part of the GoFAR program. The program lasts 10 weeks with each session lasting 60 minutes. We are still enrolling volunteer families to participate in the program. The project is funded by the National Institute on Alcoholism and Alcohol-Abuse (NIAAA). It is located in the Department of Psychiatry and Behavioral Sciences, Emory University School of Medicine, Atlanta, GA. Principal Investigator: Claire D. Coles, Ph.D.
Co-Principal Investigators: Julie A. Kable, Ph.D., Dorothy C. Strickland, Ph.D.
Research Coordinator: Elles Taddeo, Ed.D.